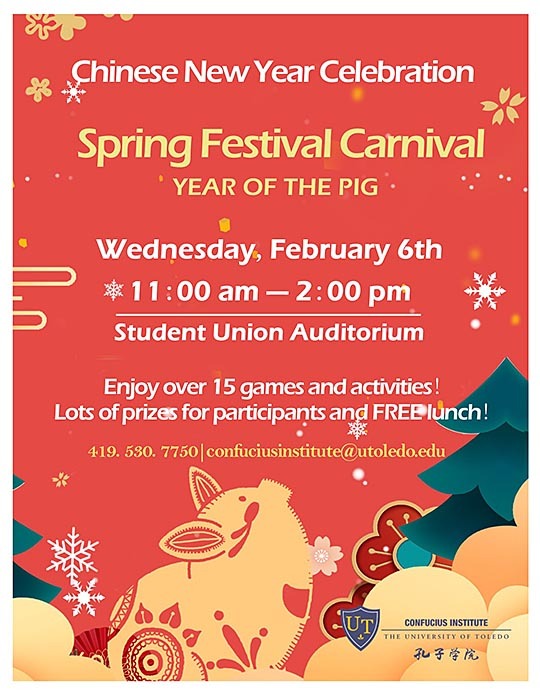 It’s swine time: Celebrate the Year of the Pig at the Chinese New Year Spring Festival Wednesday, Feb. 6. The free event will take place from 11 a.m. to 2 p.m. in the Thompson Student Union Auditorium. Those who attend the event will have a chance to take part in more than a dozen cultural activities, including Chinese paper cutting, paper folding, calligraphy, lucky bracelet making and more. Several traditional Chinese games such as ring toss and pingpong also will be available to play. “Participants will need to get involved to collect stamps for free meals and redeem for prizes,” Yu said. The Chinese New Year is the most important holiday for the Chinese and is a time for family reunions, according to Yu. Many of the traditional rites and activities during the Chinese New Year are meant to bring good luck to the household and long life to the family. The Confucius Institute serves northwest Ohio by providing education in Chinese language and culture. It also offers opportunities for cultural exchange between China and the United States. For more information, call the Confucius Institute at 419.530.7750 or email confuciusinstitute@utoledo.edu. Follow the UT Confucius Institute on Facebook. This entry was posted on Monday, February 4th, 2019 at 4:58 am and is filed under Events, UToday .